I have a questions for you F'ers. Did the "F's" have a rear fender in the U.S.? In looking through the fiche it looks like there were two different styles for the rear fender depending on market code, but I am not seeing a version for the U.S. market? In looking at most of the pictures of "F's" I am not seeing a rear fender? The license plate kinda acts as a rear fender and mounts to the chrome bar rapping the rear of the seat. In looking at the Honda ID books its showing a rear fender for the "F's" but Like I say there is no part number for a generic or U.S. specific rear fender. 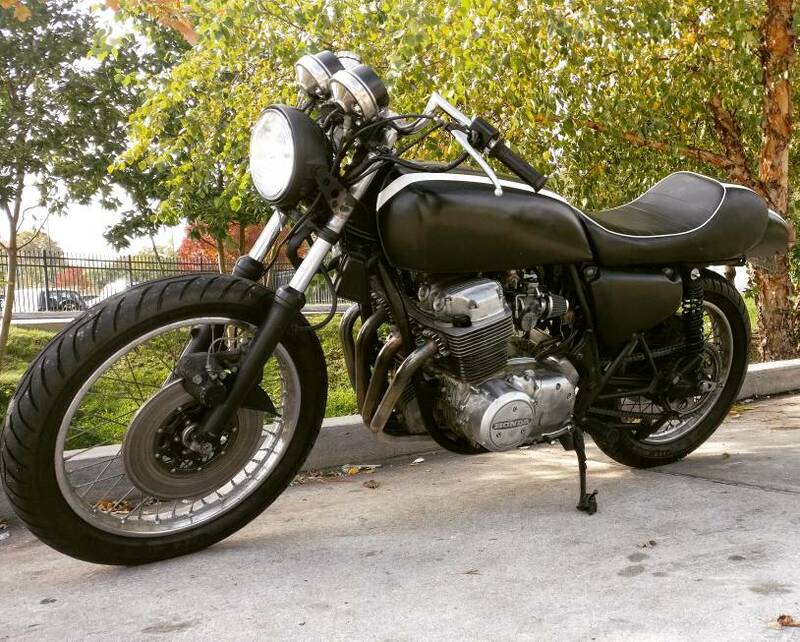 I talked to a local CB750 guru and he thinks everyone tended to take them off because they detracted from the overall cafe look. I'm in the final throws of finishing my '75, CB750F and just noticed this issue as I was going through the rear end the other day and realizing I did not have a rear fender on the bike when I got it 25 years ago is what appeared to be stock trim. I think the U.S. F0 and F1 did not. I have seen F2/3 with a rear fender. However, I am not an authority on the subject. My wrecked F0 parts bike and F1 survivor did not have a fender. Yes a local guy here has three parts bike, mostly complete, 2-'75/'76 F's and 1-'77/'78 F and none of them had fender bits left, but he is the one that said he thought everyone took them off but wasn't sure, in his case he is more of a "K" freak. I was a K freak too until I found this F. When I got it I thought if felt bigger than my K and less nimble. Now that it's got the triple discs, new seat cover and sounds good it's the one I get on when I open the garage door. Over the weekend the guys were all talking about their new Harleys. Someone asked if I have a new bike. I said yep, my new one is 37 years old my old one is 43. Correct, the F0 and F1 did not have a real fender, just the 2 inner plastic pseudo-fenders. The 77/78 did have a fender though. Thanks muthaF'er, er Jerry, I knew you would know!! So I'm sure it's been discussed before but I searched and can't find the answer I'm looking for. How do you clean the gas cap vent on an F1? If it's worth doing, it's worth doing twice. i soaked mine in evaporust overnight, then blow it out using compressed air, then washed with wd40. i'm sure there are other good ways too??? I don't have it in front of me right now.. can you take it apart? Do you need to? Or do you just pull the rubber seal off and chuck it in some sort of rust remover? Yeah!!! Thanks y'all. I just put new coils on my 76 F.. the ones from cb750supply.com. I think maybe they're Emgos? Regardless, bike starts much easier now. I think I have a fuel supply problem though, thus the question about the gas cap. Resurrecting this thread as I have just read through the whole lot after getting myself a '78 F2 and not really finding much on the F's elsewhere. I've got a lot to learn! My Red has engine, fork and wheels from 78 SS, it is basically an F.
Man, I forgot about this thread. I suppose I should add my 750F and also pictures of the one that I arranged to buy last week, a '78 F3. The F3 is actually for a really good friend of mine (and former roommate) that has been interested in an SOHC4 for a while. Back in the early 1980's when I he turned 16 (and I was 18) I took him to the local DMV on his dad's CB500K to get his license, so he's been a fan for a long time now. Tewes19 (Nick) actually pointed me at this bike. Fortunately for me he spent all his cash on his K0, so I benefited from his bike fund being temporarily bare. The bike is in Minnesota and has about 15k miles on it. I think the seller is the original owner. It does run and comes with the title. I have more pictures than I will post here, but it appears to be complete and stock. I plan to take a couple days off from work mid-week sometime this month to head up with a trailer to get it. I'll get it tuned up over the winter and install new tires and whatever else it needs. My buddy will come up from his current home in Albuquerque sometime late Spring and we will ride our F's back there together. I am surprised you don't see a lot that are cut, just below the plate. . I recently found a couple F's, a 77 and a 78. Both had the rear fender. I passed both of them along to a member here. Here's my mostly-stock F0. I just got it running, so I haven't done any cosmetic work on it yet; the missing badges, rattlecan orange-peel paint job, and exhaust wrap residue are bugging me fiercely. PO dropped it off at a shop that didn't tighten the cam sprocket knock bolts after doing some head work, which caused the timing to slip while running and all the valves got bent. Runs sweet now though! Wow it has been a long time! I started a newbie build on the forum back on Jan. 2011 and finished the build in 2016 but I don't think I ever posted the result. I used PhotoBucket back then and now it appears they are charging. Let me try Google and see if this works.